We now have theAi? 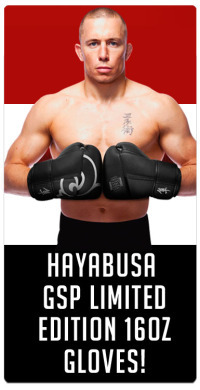 ?Hayabusa Limited Edition GSP 16oz GlovesAi? ?in stock available to buy from our site. TheseAi? ?Limited Edition GlovesAi? ?will only be available while stocks last, and they’re already flying out fast. Check them outAi? ?on our site now to get yours (each pair of gloves comes in it’s own individual collectors edition presentation box). This entry was posted in News and tagged GSP, GSP Gloves, Hayabusa, Hayabusa GSP Limited Editions 16oz Gloves, MMA on 3.05.2013 by .